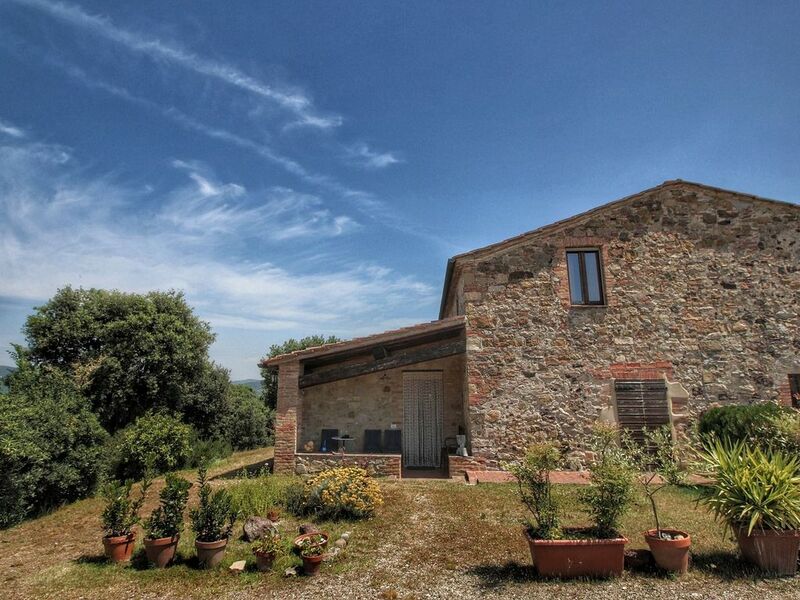 Olmi holiday house is a rustic house in a rural area close to Casole d'Elsa, Siena, Volterra de Chianti. There are 2 apartments for guests and an apartment where the homeowner himself lives in the rustic house. Each apartment has a private garden and terrace and you have a fantastic view of the Tuscan hills in every season. The holiday house is 12 km from Casole d'Elsa and Radicondoli, typical little medieval villages with lots of charm and character. It makes a perfect base for exploring Tuscany, the sea and the Maremma. Cities such as Siena, Florence, San Gimignano, Volterra, Monteriggioni and Massa Marittima are easy to reach via good roads. The renowned Chianti wine region is just 25 km away. Dinner is available upon request and for a fee and features organic produce from the owner's own vegetable garden, as well as other regional products. The garden is a wonderful spot to enjoy the view. There is an aboveground swimming pool and various rivers with clean water in the surrounding area. You can also swim in the naturally warm water of the Petriolo hot springs. Mooi huis in een prachtige omgeving. Huis was erg schoon en de ontvangst hartelijk. Hebben veel tips gekregen over uitstapjes van de eigenaren. Als je wilt is er veel in de omgeving te doen van bezoeken van Sienna en Florence tot zwemmen in natuurlijke warm water bronnen.